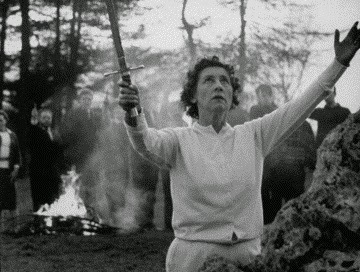 Eleanor “Ray” Bone is a prominent figure in the history of Wicca. She was an initiate of Gerald B. Gardner and for many decades Eleanor was the High Priestess of a coven in London. She is often known as the Matriarch of European Wicca, because most Gardnerian initiates in Europe trace their roots to Ray Bone’s coven. Eleanor Bone was devoted to Gerald Gardner and in 1968, she travelled to north Africa to visit his grave in Tunis. There she learned that the cemetery was to be closed down, the graves removed, and the land turned into a public park. She raised funds within the Wicca community to ensure that Gerald Gardner’s grave and headstone were relocated to a cemetery close to the ancient city of Carthage, where they can still be visited today. In the early 1970s, Eleanor retired to Cumbria in to spend her remaining years in the part of north-west England that she loved so much. When she died on the 21st of September 2001, she had lost touch with most her initiates, many of whom were elderly or who had predeceased her. Eleanor had no funds of her own, nor did she have any family left to pay for her funeral costs. She was buried at the back of the community graveyard in Garrigill in a grave without a headstone. The Eleanor Bone Memorial Fund has been established to raise £2,000 to buy a headstone and to honour Eleanor in the same way that she honoured Gerald Gardner, by ensuring that her grave is marked and may be visited by generations to come. With your help, we will be able to erect her gravestone for Sunday, September 20th, 2015, 14 years since her passing into the Summerlands. The fund has been established to ask for donations large or small from those who love the Craft as Eleanor did and who wish to see her memory honoured. All those making contributions will be listed and their personal messages entered into a document honouring Eleanor‘s memory. We will be inviting donors to the memorial event on Sunday September 20th 2015. More details will be available nearer the time. All funds raised will go directly to the costs for Eleanor Bone’s gravestone. The committee members are freely donating their time and effort. Any additional funding raised over the cost of the headstone will go towards supporting the memorial event and the upkeep of the grave in the future.